Have you ever looked at your forehead? I am sure you must have and you have also noticed the lines on your forehead. There are seven lines on our forehead. However, for some few are more prominent than the others. The prominent ones might be three to four in number. You will be surprised to know that these lines can tell a lot about your personality and even about your future. We will now discuss about these lines on forehead. It is not possible to cover all the lines in this one article. This is exactly why we will select one line which is also called the line of wisdom. 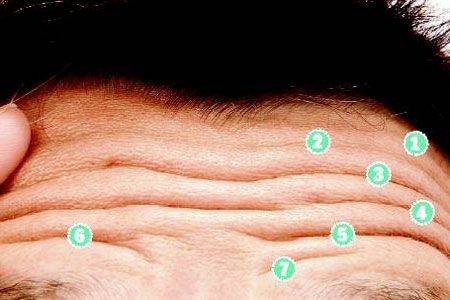 It is one of the most commonly found lines on a forehead. Many people do belive that this is not possible, to understand someone from the lines on their forehead. However, the experts can read these lines and tell volumes about your future. We will discuss the same in more details now. The line number two in the picture enclosed is the line of wisdom. This is the second line from the top on any forehead. The stronger the line the more knowledgeable the person will be. As the name it suggests that this is the line of wisdom. The people with a strong line of wisdom will be level headed. They will be good with judgement. Mostly the ones with a strong wisdom line will be leading their friends. They will have a personality that great leaders have. These people generally have high self confidence. Those who have a light line of wisdom generally don’t get into fields that need a lot of knowledge and study. They tend to take life lightly and have a lively personality. If the line branches out then these people are deceiving in nature. They can also be a little foolish and casual in their approach to life. Broken line of wisdom may mean that the person will suffer from lack of ambition. All those who have a deep and smooth wisdom line will persue a career that requires a lot of knowledge and learning. They will be good and successful as writers and teachers. These people can also hold high rank in the government of the country. You may find it strange. Nevertheless, if you start looking for this line you will be surprised to see how true these theories are. This line is also associated with success. However, on the negative side it is said that people with too strong wisdom line take life very seriously. They may suffer from diseases of heart and blood pressure as they make everything a serious affair. These people are over ambitious and they are not great family men. As a result marriage and children suffer. They can be a little boring to get along with as they have good personalities and are not fun loving types. These people are committed and can be trusted easily. They will never cheat you or do anything that is immoral. This is perhaps the other side of the coin. They are loyalists and can also be quite creative. Writing comes very easily to those with a strong line of wisdom. If you are in a relationship with someone with a strong wisdom line then you will definitely find this article of interest and it will help you to understand them better. They might appear to be a little cold at times but this is just how they are the coldness is not at all intentional. You can also be rest assured that these people will achieve great success in life and will never let you live in poverty until and unless there are some other astrological influences. It has been noted that many famous leaders and scientists generally have a very deep and smooth line of wisdom on their forehead. This is the most prominent line that you can see on their foreheads. I hope you have got a clear understanding of the line of wisdom that can be easily found on any forehead. It can say a lot about the person. These lines are different for each one of us as our personalities and characters are different. This is just a general idea about the line of wisdom. We recommend that you visit someone who is an expert in this field in order to understand the concept better. These lines can only be understood by those who have a deep knowledge on the subject. Someone with an average knowledge may misguide you. This is all that we had to discuss about this interesting line that we all have on our foreheads. I am sure this will help you to understand the line and its importance better. This will also give you a good insight to understand those who have a strong line of wisdom.